As an introvert who also loves big family weekends, having different spaces for everyone to spread out in the cabin was really important to me. That way if you wanted to have a group play cards while someone else (like me) preferred to quietly read in a corner, you didn’t have to overlap too much. Plus, now that I have a kid I totally see the appeal of corralling a bunch of them into a playroom so that the adults can get a little peace. For each common space, I wanted there to be a clear focus, sort of guiding the activity there. For the living room, it’s the vintage fireplace; for the game room it’s the vintage poker table; for the backyard there’s a sunken dining room and another vintage fireplace. Every space encourages gathering around something. 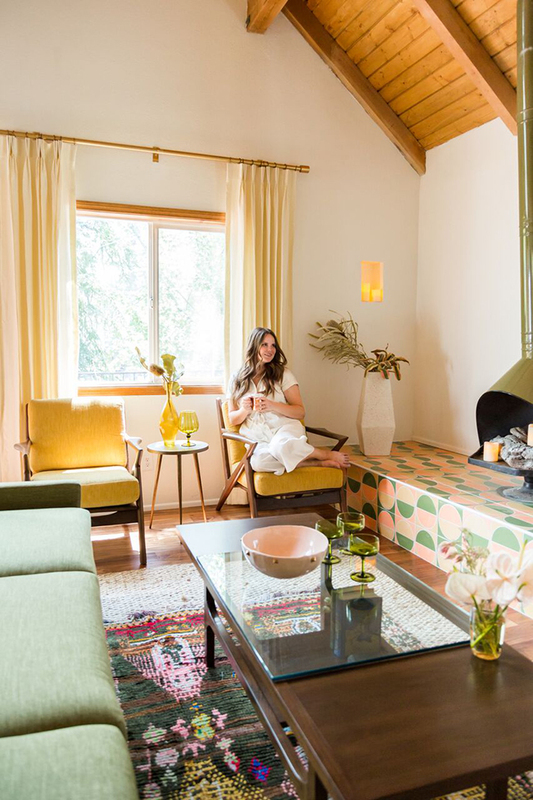 The first piece I got for the living room was the avocado vintage fireplace that I found through The Retro Burn, who basically has the market cornered on badass beautiful vintage fireplaces. Once I saw the fireplace, it locked in the sunny color palette of avocado, sorbet pink, and marigold. I got the tallest fireplace I could find, but when we put it into the space, it missed the ceiling by a few feet. Solution? A platform! I had already decided on the epic Fireclay tile for the kitchen backsplash, so we just continued the same motif on the platform. 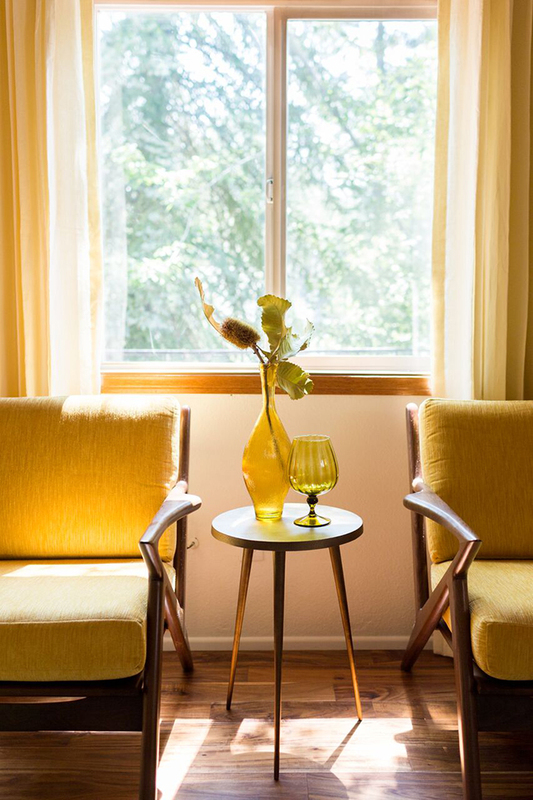 I can’t imagine the living room without it now – it’s such a set-piece. Not only does it raise the fireplace into everyone’s eye-line, it adds casual seating around the living room, too. 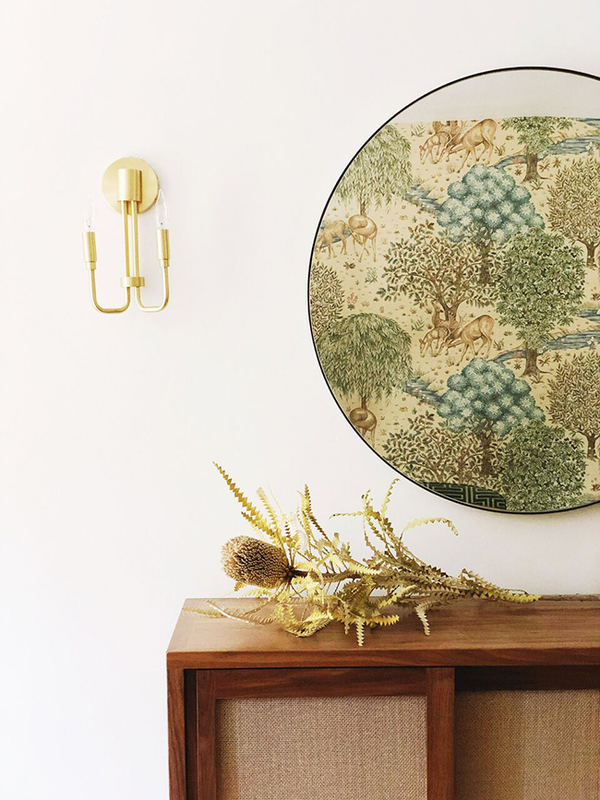 I filled the living room with pieces from Joybird – their mid century modern look is iconic, but somehow still feels really contemporary and not over-styled. I took the book of fabric samples and held it against the fireplace until I found the color that perfectly matched: Key Largo Green. Looking at the color in the tile, I used Bentley Daisy on the two Soto chairs in the corner with the West Elm Tripod side table between them. I didn’t want to do something too heavy for the coffee table, and I love the glass element in the Tate table. 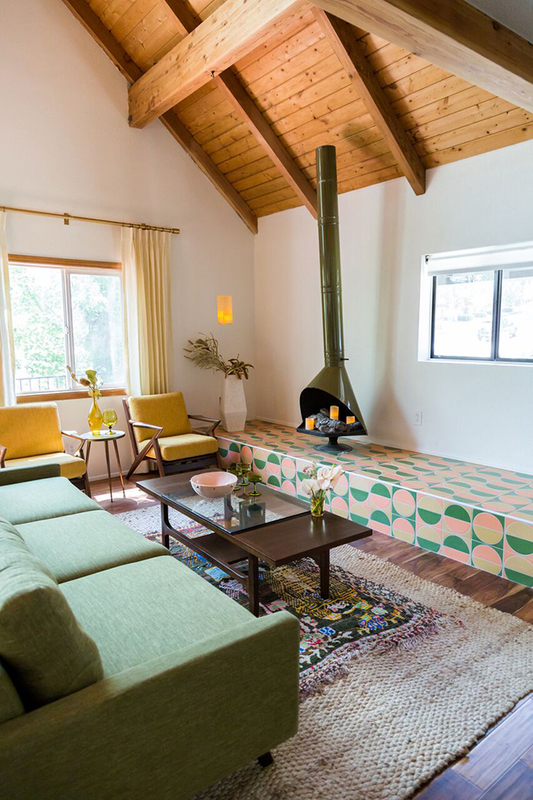 I added a few vintage amber glass vases to catch the light and echo the colors in the furniture, and then put a West Elm Terrazzo planter in the corner to fill the space a bit. The linen curtains in Ecru by Shade Store add so much drama and height to the space – I love the effect drapes can have on a room. At some point I want to put a TV in the corner, but for now, I like keeping the space clean and the focus on the fireplace. Around the corner from the living room is the mudroom/hallway. When we first got the house, this area was a weirdly sized dark cave – a little too small for it to be a den, but too big to just throw a mirror up and walk away. Adding a glass door to the game room made all of the difference. Light finally filtered through the space, making it one worth spending a little time in. This area is right off of the garage, so I outfitted with everything you’d need to dismantle yourself after a day in the snow. 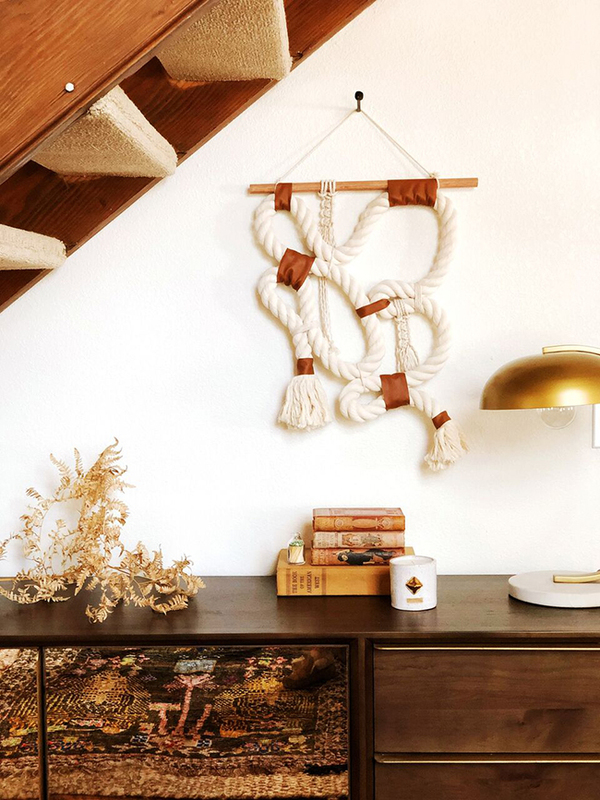 I used some items I had in storage – the coat rack and couch – and added rustic minimalist items from West Elm. First is a beautiful console so I have somewhere to stash my keys (I’m the most absent minded person and am constantly losing my keys). Above that is a simple mirror with a leather strap around it, giving it just a little bit of detail. 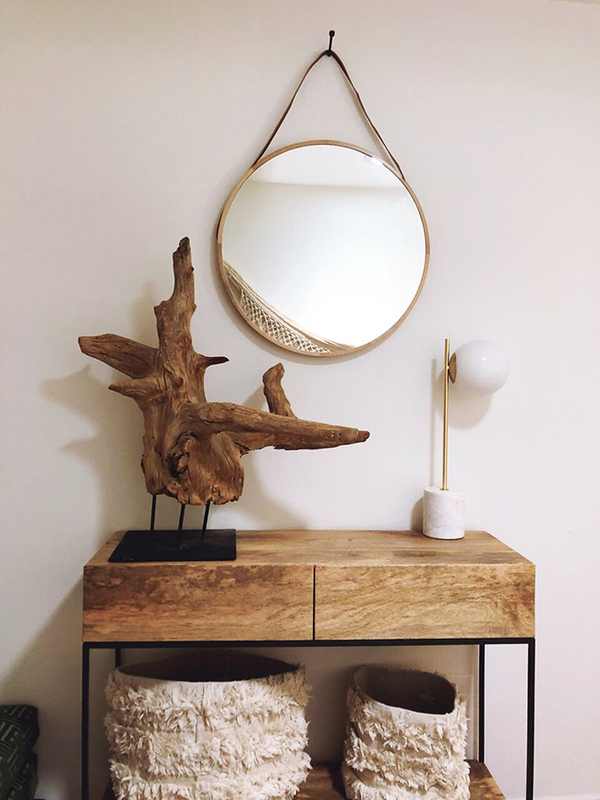 I put a large wooden sculpture to connect the mirror to the table, and then included a little emerald Lux Eros plate for keys to connect with the game room – it’s the only pop of color in the whole space. Below the console, I had a few extra Pottery Barn Kids Baskets that I thought would be perfect for scarves, gloves, heavy socks, etc. Above the couch I hung a sisal hammock that Craig and I got on a trip to Merida a few years back – I’m so happy to finally have a place to put it. Tucked next to the couch is a cute stump side table by West Elm, which adds the perfect “mountain cabin” touch. Going through the hallway, we’re now in the game room – which might be one of my favorite spaces in the house. 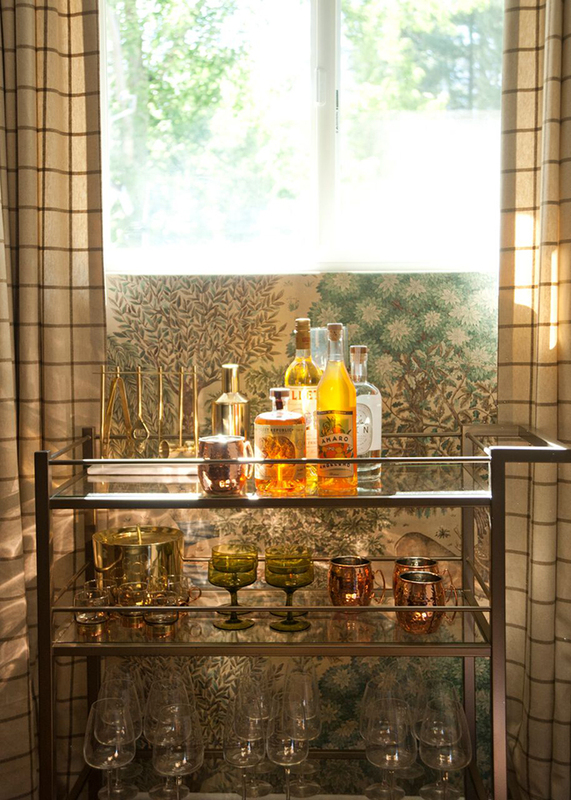 Every time I posted a photo of the gorgeous W Morris wallpaper from Style Library, I would get comments asking about it. It adds so much to the room, and I especially love it with the elegant Room and Board furniture throughout. 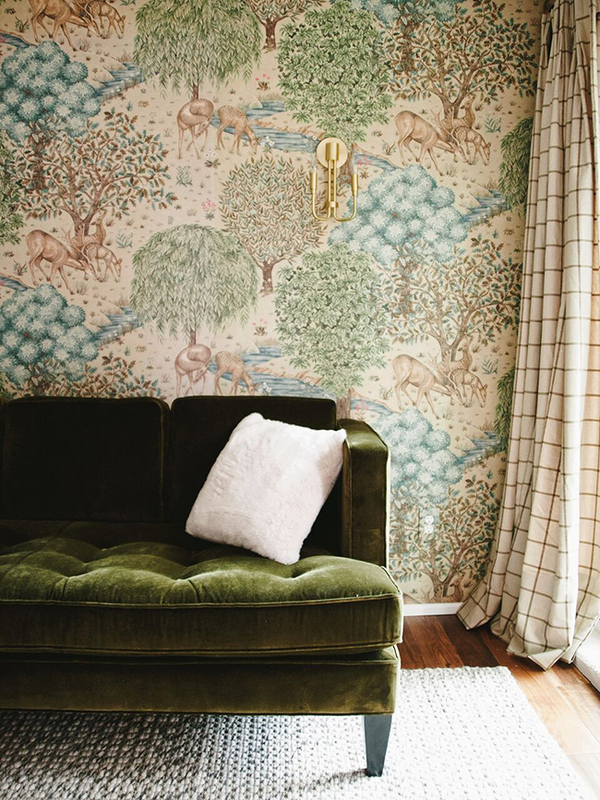 The corner with the flannel drapes from Shade Store, velvet of the Hutton sofa, brass from the Brigitte sconce, and the wallpaper all cross over if my favorite. I love all of these textures and colors, and can’t wait to sit in there during the wintertime. A game room wouldn’t be complete without the games, and I’ve been low-key stalking Ridley’s game for a while. Their aesthetic is amazing, and perfect for a sometimes family/sometimes adult space depending on who the guests are. I felt like an epic bar cart needed to make an appearance somewhere, and the den-like quality of the game room felt like just the place. I used the Brixton Bar Cart from Room and Board and filled it with some of my favorite vintage pieces as well as some new ones from West Elm. The copper Moscow Mule mugs are necessary for a cabin weekend. Moving outside through the Game Room, you’ll find the backyard. 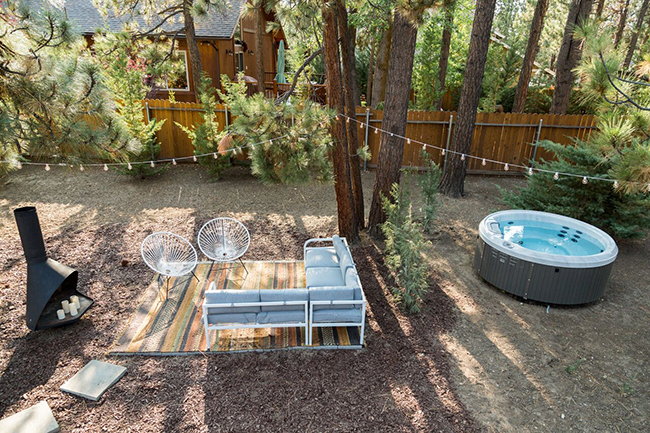 When we first got the cabin, the backyard was a bit of a blank slate – just a yard with some trees. 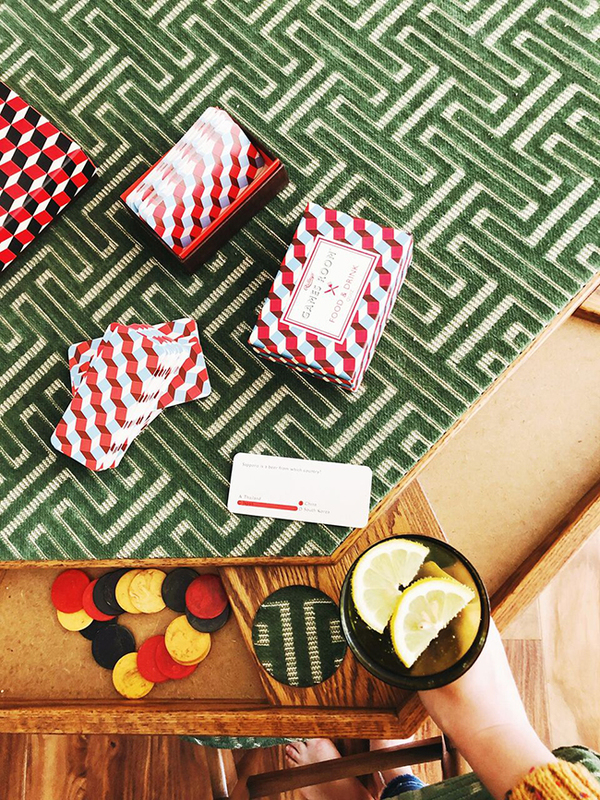 I wanted to create spaces for lounging and vignettes that *sparked joy! 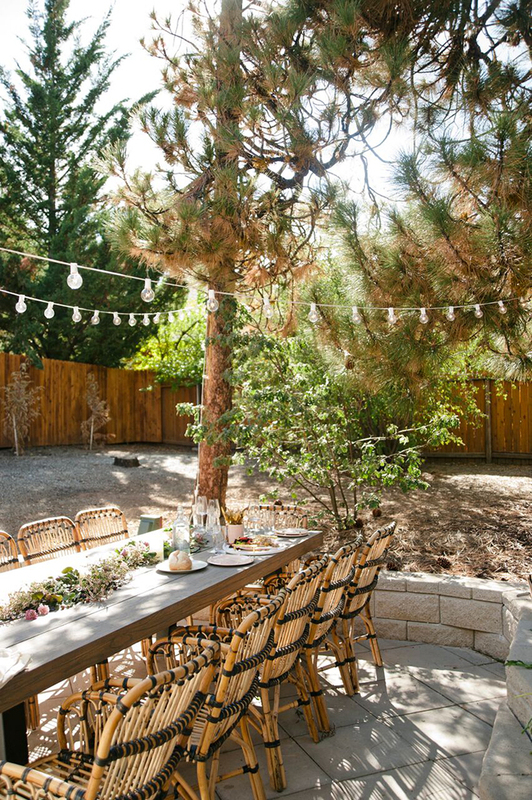 * So the first spot we started in was the outdoor dining room. This was a small slope hitting the garage, but now it’s a large flat surface right off the game room. The Tavola Dining table from Article is so gracious and large, and I love the texture of the Malou chairs. The table is meant for 8, but I think it could easily fit 10 or 12. Above the table we hung market lights from Box Hill, and continued them to the outdoorlounge area to create evening sparkle moments. We laid a flat pad of pavers (Craig and I did this over a weekend – it was surprisingly hard) and put the Yosemite Rug from Box Hill on top of it. I found this amazing vintage fireplace for $50 on Craigslist in Big Bear, and spray painted it with heat-proof paint to touch it up a little. You’re not meant to have any charcoal or wood fires outdoors in Big Bear, so we filled our fireplace (and the one in the living room) with electric candles to get the effect of fire without the risk. 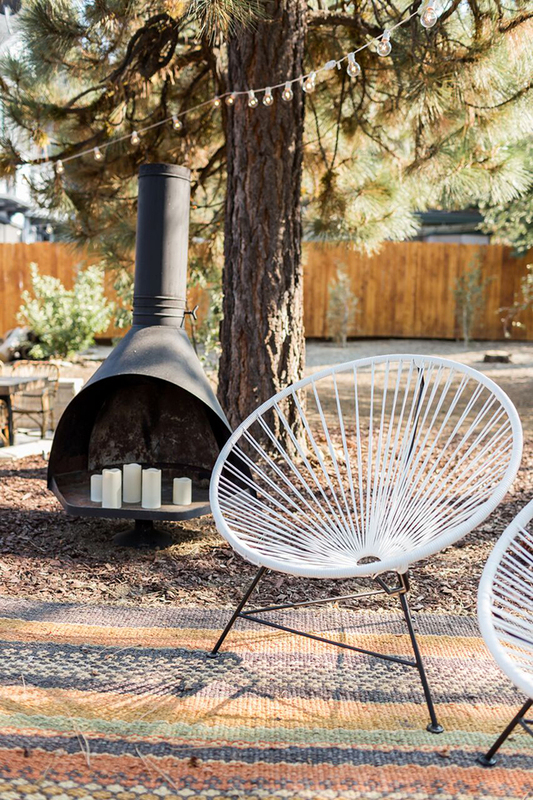 To keep the mid century inspired look of the interior, I added some acapulco chairs next to the fireplace, and then another solo one in the corner of the yard. I love the idea of little hidden corners, and having a quiet corner next to the bird feeder, with a large outdoor blanket, seems like the best place for a book on a breezy day. While we’re outside, there were a few little changes I made to the exterior of the house. Paint can make all the difference, and throughout the inside of the house, adding a fresh coat of Whisper by Dunn Edwards made the living room look like it gained an extra few hours of daylight. On the exterior, I changed the doors to Teatime Mauve – the perfect not pink/not grey tone. I also switched out the light fixtures to Smyth by Troy, which kept the classic silhouette but with modern details.